Mid-level model in the Torus TOT range, sitting above the Mini and rated at 8A with 1840VA toroidal isolation, NBT and 4 AC outlets. 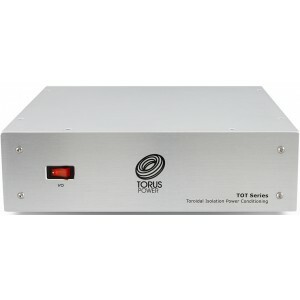 Torus TOT Max is the "big brother" of the TOT Mini power conditioner from Torus Power. The TOT Max UK differs from other power conditioners on the market via a patented technology unique to the Torus range. NBT works by removing both common-mode noise and differential noise the AC supply line delivering the cleanest power to your equipment. NBT toroidal transformers attenuate both common-mode and differential noise without the need for any additional circuitry or low pass filters. The typical cut-off frequency exceeds the performance of most commercial filters, starting at 1Khz (with no resonance effect) at a slope of –20 dB / decade to –70 dB at 500 Khz, and –50 dB at frequencies between 2 Mhz and 1 Ghz. TOT Max features a much larger 1840 VA isolation transformer, compared to 680 VA in the Mini model, and as such is capable of delivering up to 8A of current with 4 AC outlets. This makes it ideal for most audio or home cinema systems including medium-sized power amplifiers. TOT models provide a convenient USB-type charger as a bonus feature. TOT models provide basic circuit protection through a replaceable varistor. Torus Power non-sacrificial Series Mode Surge Suppression (SMSS) is also available as a factory-installed option at a premium. (Not included as standard).